Road-building is the engine of progress and the enabler for destruction. With completion of the 3,400-mile Transoceanic Highway, the Amazonian state of Acre in Brazil now connects with the southern Pacific Coast of Peru, unleashing numerous impacts to the environment and indigenous people. 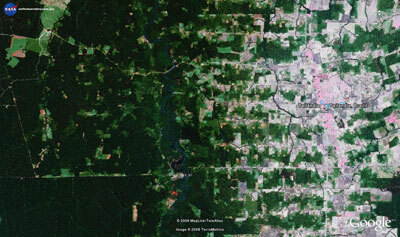 The Trans Amazonian Highway, a 2,000-mile paved road bisects the lush Amazon, finished mostly in 1972. Intending to connect important cities and move commodities to urban markets, highway construction is an ongoing project causing great deforestation as it will now connect with the Pacific Coast of Peru with the Interoceanic Highway project. The 2011 completion of the 3,400-mile Transoceanic Highway nears, connecting the Amazonian state of Acre in Brazil with the southern Pacific Coast of Peru. Supported by governmental and multi-national development interests, it promises to internationalize Brazilian agricultural products, mainly soybeans and cattle, while providing improved mobility to people across the region. Unfortunately, the record of highways in the Amazon is bumpy and washed-out, filled with road-killed species, massive deforestation, rampant erosion and micro-climate modification, fragmented habitats, wildlife movement blocked, indigenous land stolen, subsistence-living destroyed, gold-mined hills stripped, rivers polluted with chemicals, oil spills, and human waste. 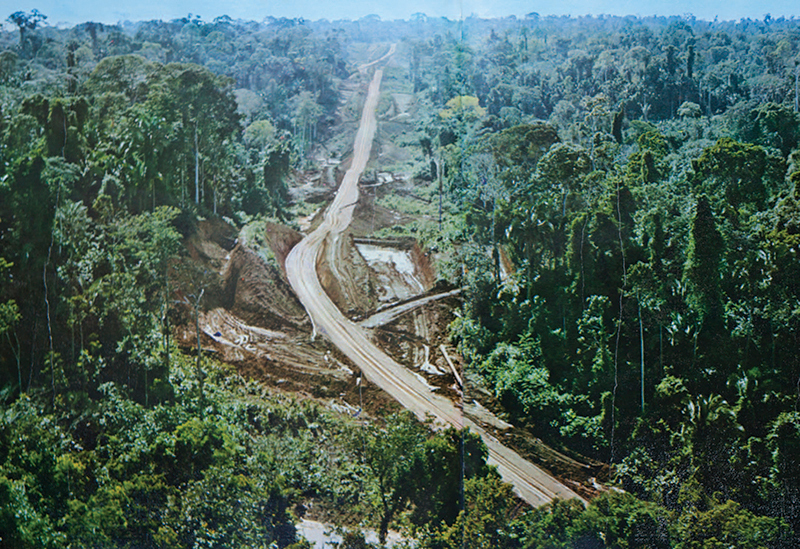 BR-163 in Mato Grosso is one ignominious example of the rainforest habitat biodiversity destruction enabled in road construction; the Trans-Amazonian Highway of the 1970s another. 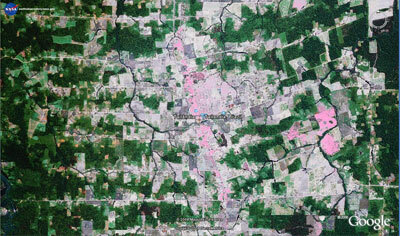 95 percent of the deforestation in the Brazilian Amazon is within 50 kilometers of a road. Timber and mineral extraction are of course enabled, as are hydroelectric dam construction. 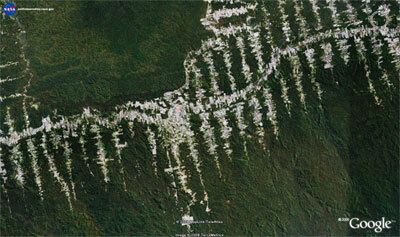 The main highway leads to expansion of unofficial road networks enabling mass deforestation and agricultural production, attracting colonists and speculators invading indigenous lands and societies. With the Peruvian Carretera Transoceanica, largely financed by Brazil and China, oil, gas and mining companies are lining up, with Asian consumer markets getting hungrier. New highways are also extending into sensitive forest areas in Guyana, Venezuela, and Ecuador, further threatening the once-lost regions with new neighbors, new possibilities, water privatization, electrification, “industrial” ecotourists and the end of a way-of-life. Impact mitigation and protection options for tropical forests and indigenous societies are limited once these large-scale projects are unleashed into the periphery, opening up wildernesses never exposed to the rumble of engines and the hard-drinking, slash-and-burning of frontier settlements. A study published in Trends in Evolution and Ecology showed that regulating access, promoting railroads, requiring environmental impact assessments prior to construction, limiting road width and gradient, restricting tree clearing and banning night time driving all can reduce impacts. But local, regional and federal agencies must participate in the project to enforce these requirements, often a difficult prospect in such remote regions. Public policies aimed at increasing the value of forest products can be helpful, in particular for honey and managed forest products. These programs can support private-sector investment and social-environmental entrepreneurship. For instance, andiroba oil producers derived from the nut of the Carapa guiansensis tree, increased 3.6 times from 2003 to 2008. As well carbon sequestration programs such as the Juma Sustainable Development Reserve in the Brazilian state of Amazonas, near the AM-174 and BR 319 highways, can protect sensitive rainforest while compensating local residents and agencies for not destroying their resources. The project is called a REDD, Reduced Emissions from Deforestation and Degredation, protecting 366,151 ha of forest and reducing 190 million tons of carbon dioxide emissions by 2050. Forest conservation and greenhouse gas emission reduction targets should be central to future climate agreements, though there again are significant enforcement deficiencies and potential for fraud and abuse, as well as challenges about whom to compensate and how. REDD can stop deforestation and eradicate poverty in many regions; families can receive direct payments or money invested into social programs, income-generating activities, and supporting local associations. “Progress” is coming to the pristine Peruvian Amazon, and steps must be taken now to minimize the damage. Sadly, there was no environmental impact assessment process, so the local inhabitants and their mountains, rainforests, rivers, and savannahs, will just have to deal with it on their own terms. The 3,400-mile Transoceanic Highway from Brazil to Peru has long been a pipe dream, but as it finally nears reality many along its long path worry that a way of life and livelihoods are in danger. The road crashes through the jungle like the fevered dream of the indomitable Fitzcarraldo, who schemes to transport a steamship overland through the Peruvian tropics in a cult film celebrating demented ambition. The Transoceanic Highway, evoking engineering marvels such as the Transcontinental Railroad and the Panama Canal, has been talked about for decades, assuming a mythic stature that has led many to question whether the east-west thoroughfare linking Brazil’s Atlantic ports with the Pacific docks of Peru would ever come to pass. Now, Brazilian and Peruvian officials are pushing for a 2011 grand opening, once the final, and most difficult, stretch of the highway is completed in Peru, where broad swaths remain dirt, gravel and mud. This is some of the planet’s most challenging road-building terrain. The southern stretch of the 3,400-mile Transoceanic Highway climbs from steamy jungle to rolling savannahs to Andean cloud forests, pine expanses and snow-blown glacial moonscapes reaching almost 16,000 feet — an elevation surpassing Mont Blanc, Europe’s highest peak — before dropping down to the arid coast. At highway speeds, ecosystems would whir by like signposts on a freeway. The road is, in a sense, the culmination of outgoing Brazilian President Luiz Inacio Lula da Silva’s determined campaign to cement his nation’s leadership role in a region where Washington’s supremacy has faded. In Puerto Maldonado, a boisterous, anarchic river port about 150 miles of dense jungle south of the Brazilian border, the sonorous sounds of Brazilian-accented Portuguese can be heard along streets clogged with motorized tricycles. Samba beats and bossa nova tunes compete with merengue and musica chica, a blend of techno and salsa, at rowdy cantinas and garish karaoke bars. Not everyone is thrilled about the Brazilian onslaught. Plans for vast new hydroelectric plants and dams in the Peruvian Amazon to help feed Brazil’s voracious energy appetite have met stiff resistance from environmentalists and indigenous groups. Skeptics warn of a quiet conquest with a smile, a handshake and lilting Brazilian charm. Once finished, the Transoceanic will provide a link to the Pacific ports of Peru for the Brazilian economic dynamo. Brazilians envision a quicker route to China and elsewhere in Asia for their abundant commodities, notably soybeans, a crop whose cultivation has already devastated vast tracts of Brazilian rain forest. Peruvians hope for a Brazilian market for food products and building material, especially with a construction boom anticipated leading up to the 2014 World Cup in Brazil. Much of the highway through the sweaty heart of South America is already built and asphalted, especially in Brazil, where the terrain is mostly flat. 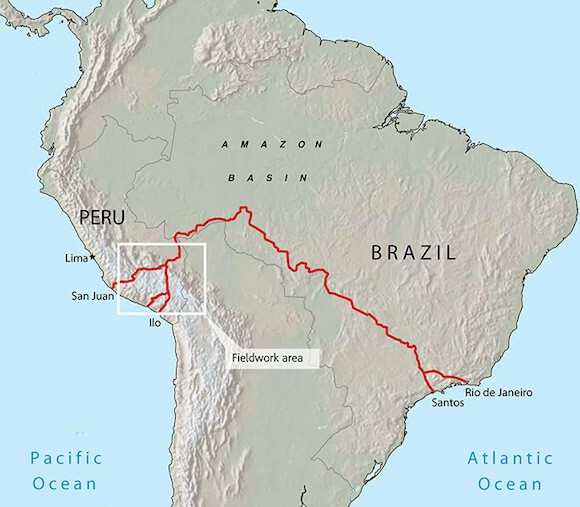 But Peruvian engineers are now hard at work on the road’s last, and most problematic, section: a tortuous, 460-mile stretch from the steamy Amazon Basin and over the frosty Andes, which will connect down to the Pacific coast. The existing roads on the Peruvian side have long been legendary, bone-crunching dirt tracks featuring don’t-look switchbacks and delays that sometimes stretch for days, especially in the rainy season. Vehicles jammed with passengers and produce occasionally plunge thousands of yards into the emerald abyss, earning a brief mention on international news wires. But even if the new highway makes life easier for drivers, there is a dark side. Puerto Maldonado and the surrounding Madre de Dios region are the heart of Peru’s gold rush country, booming now that the precious metal is fetching record global prices. Amateur prospectors have scarred the jungle and befouled the waters in a region that is home to one of the globe’s most diverse collections of animals and vegetation — as well as a homeland for indigenous tribes, some ensconced deep in pristine forests, possibly uncontacted. Visitors here are warned not to eat river fish: It may contain mercury, a toxic metal used in processing alluvial gold. The gold fever, an illegal logging industry and an ongoing population explosion in the Peruvian Amazon have contributed to a frontier-style social crisis of escalating proportions. Clinics, schools and public services are overwhelmed. Prostitution, illicit drug use and alcoholism are rampant. Enforcement of environmental laws is lax to nonexistent. Tensions about land rights and resource use have sparked unruly protests. Jesus Primo Rocha, a truck driver, earns his keep on the road. But the coming of the new highway has signaled the beginning of the end. He and others who have long maneuvered the perilous route from the ancient Inca capital of Cuzco in the Andes to Puerto Maldonado (until recently three days’ travel barring landslides or other misfortunes, but now closer to two days) say they can’t compete with the modern Brazilian fleet, or pay the high fees for a commercial driver’s license in Brazil. For the thriving riverside ferry industry, a new suspension bridge seems likely do to what the railroad did to Old West stagecoaches. The steelwork for the nearly half-mile span lay in an airport warehouse for more than 25 years, an extended reprieve that the ferrymen hoped would last forever. Finally, though, the beams are going up and la Transoceanicais moving from myth to reality. The bridge’s concrete columns rise from the muddy waters of the Madre de Dios River like a sci-fi monster. Someone’s notion of progress is coming, for better or worse. Chavez reported from Puerto Maldonado and McDonnell, a former Times bureau chief in South America, reported from Los Angeles.